Aulanko Lakeside - A unique multifunction villa for business & private use! Main Villa 2019, other buildings renovated in 2017. 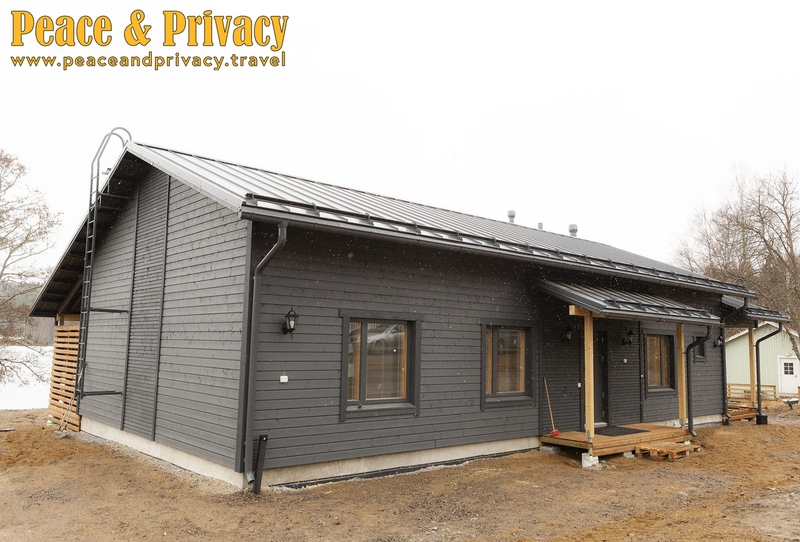 The entirety of Aulanko Lakeside’s four buildings is available for our customers starting in May 2019 when the new multifunctional villa finishes construction however, as always, we are already taking in reservations! Before the new villa is finished the other buildings are available as a part of the Aulanko Lake Corner. 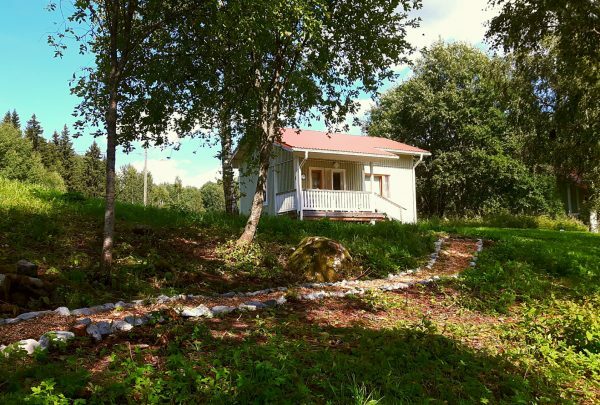 Come and have vacations, meetings or just a simple relaxing getaway from the city in the gorgeous national scenery of Lake Aulangonjärvi in Hämeenlinna! The new Aulanko Lakeside opening in May 2019 is a versatile concept for private and business customers to have vacations and meetings. It works as well for business customers’ meetings, customer events and recreational events as it does for private customers’ vacations, celebrations and parties. The Aulanko Lakeside consists of four buildings and offers approx. 22 bed places on the shore of the beautiful Lake Aulangonjärvi. It’s located only 15 meters from the shoreline and 5 kilometres from Hämeenlinna’s city centre! The Main Villa is brand new with all modern comforts, 15 bed places and is scheduled to be finished in Spring 2019. 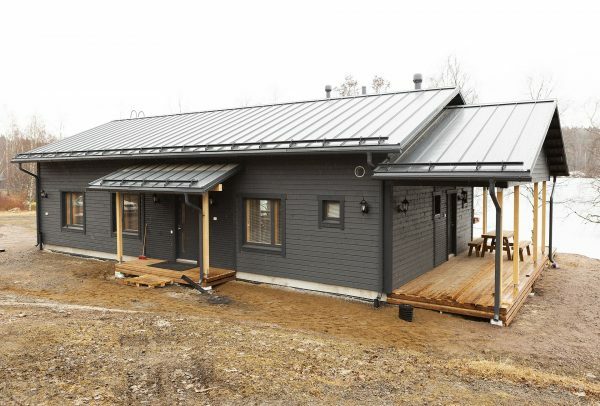 The other buildings include the Small Villa offering 5 bed places alongside a modern kitchen and bathroom, the lakeside sauna next to the Lake Aulangonjärvi, and the sleeping cottage built for year-round use offering 4 bed places. These buildings have been renovated in 2017. Accommodation: The entirety of Aulanko Lakeside’s four buildings offers up to 23 bed places. The Main Villa has 11–16 bed places in 3 bedrooms and on the main hall’s convertible couches. The Small Villa has 3 beds and a 2-person convertible couch. 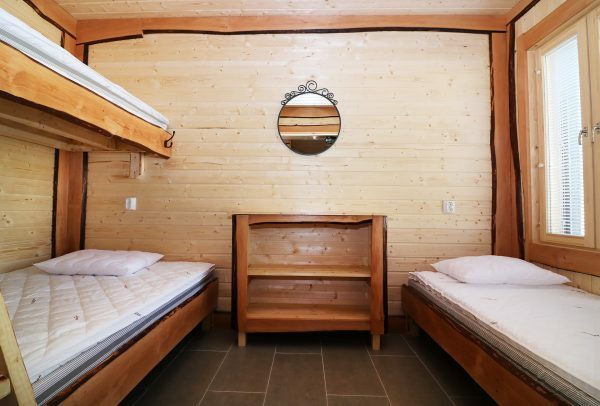 The lakeside sauna’s bedroom has 2 beds and the sleeping cottage has 4 beds. Main Villa: Despite the modern comforts the Aulanko Lakeside’s Main Villa’s decorations still greet you with the original atmosphere. You won’t see any white plaster walls, modern furniture, glass surfaces nor the latest design in the multifunctional villa. Instead you’ll find an atmosphere that definitely won’t leave you cold. The main material is wood and the craftmanship of the local carpenters can be seen in the true and sturdy furniture. View detailed floor plan of Main Villa. 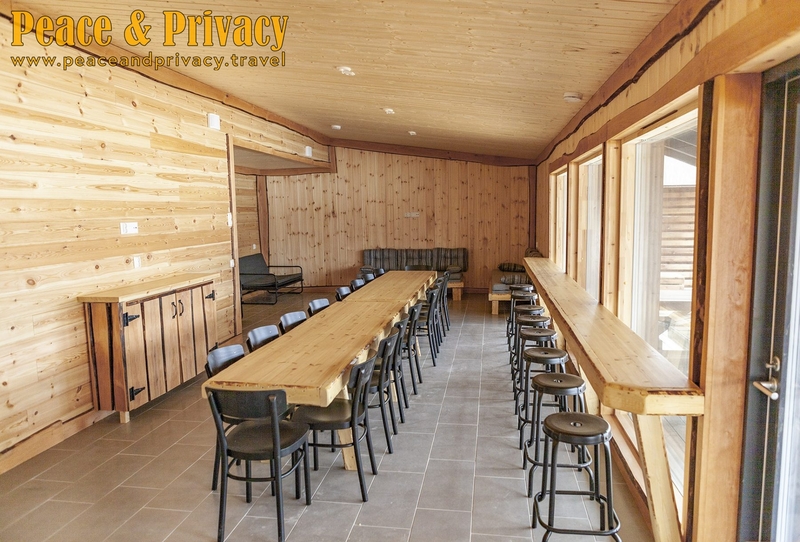 The Main Villa has a total area of 130 m2and the spacious 50 m2 main hall is just shy of 3 meters high and has seats for 20 persons to sit along the long wooden table. The same space can also be used for accommodation with the 2 convertible couches. The whole building has a free wireless internet access and large flat-screen TV which work nicely as regular TV as well as presentation screen. The main hall has also a direct access to the terrace which presents a beautiful view across the Lake Aulangonjärvi to the granite observation tower. The Main Villa has tableware for 20 persons, an electric stove and oven, a large fridge, a freezer, a dishwasher, a microwave, a Moccamaster, an electric kettle and a toaster. The electric sauna at the end of the Main Villa sits up to 8 persons at a time to relax in the sauna. 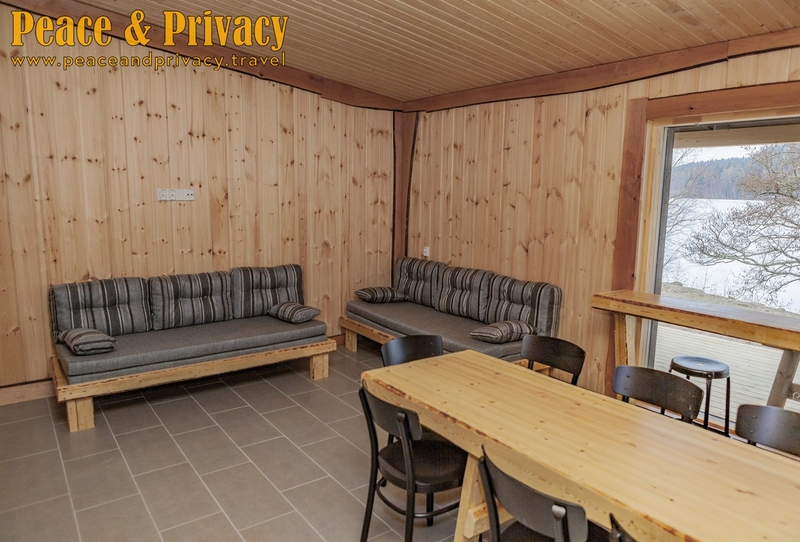 The sauna has a direct access to the terrace which again is just a few steps away from the refreshing lake and the warm hot tub on the terrace. 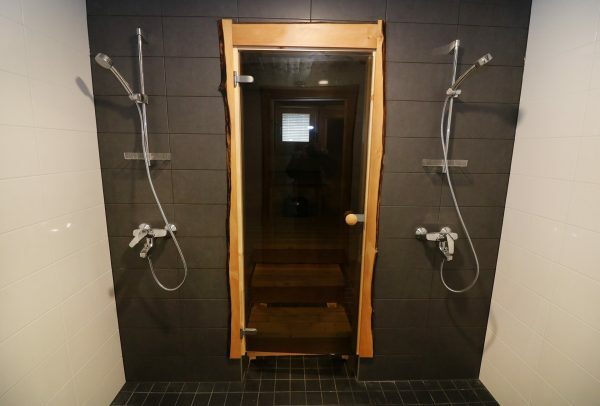 The sauna’s bathroom has 2 showers and a toilet. In addition, the Main Villa’s lobby has a separate WC. Small Villa: The Aulanko Lakeside’s Small Villa has a 2,5-meter long wooden table that sits up to 8 persons to dine and socialize. 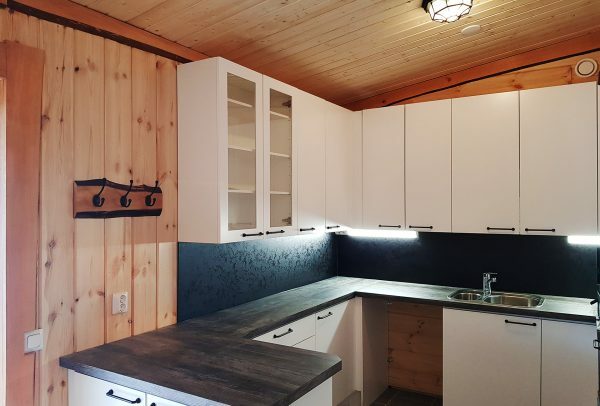 The kitchen has tableware for 10 persons, a fridge-freezer, a stove and oven, a microwave, a dishwasher, a Moccamaster, an electric kettle and a toaster. The kitchenette has also 2 bed places on a single convertible couch. A 50” flat-screen serves a TV as well as a presentation screen. The separate bedroom has 3 bed places. A bathroom with a shower is conveniently built as an extension to the entrance. 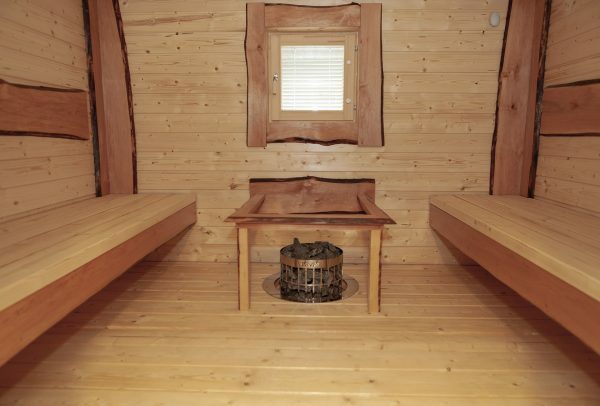 Lakeside Sauna: The Aulanko Lakeside’s outdoor sauna is located just 20 meters from the shoreline. 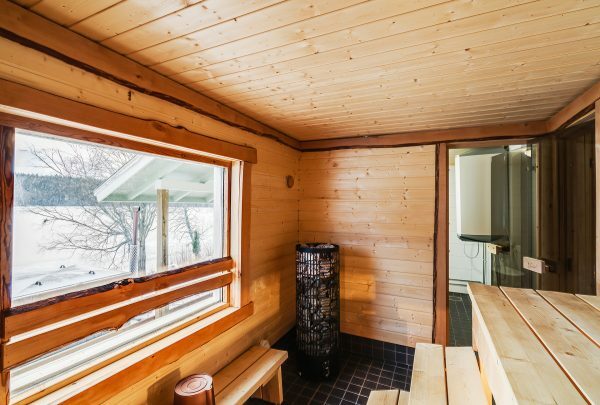 The sauna has space for 8 persons at a time and has a direct access to the terrace and from there to the lake and back via the ladder for quick cool-offs. The sauna also has a shower and a toilet. The dressing room has space for 8 persons to cool-off and socialize. The building has also a small bedroom with 2 bed places. The lakeside saunas terrace has a large hot tub for 6 to 8 persons to soak in and wonder about the meaning of life while admiring the scenery – any time of the year! 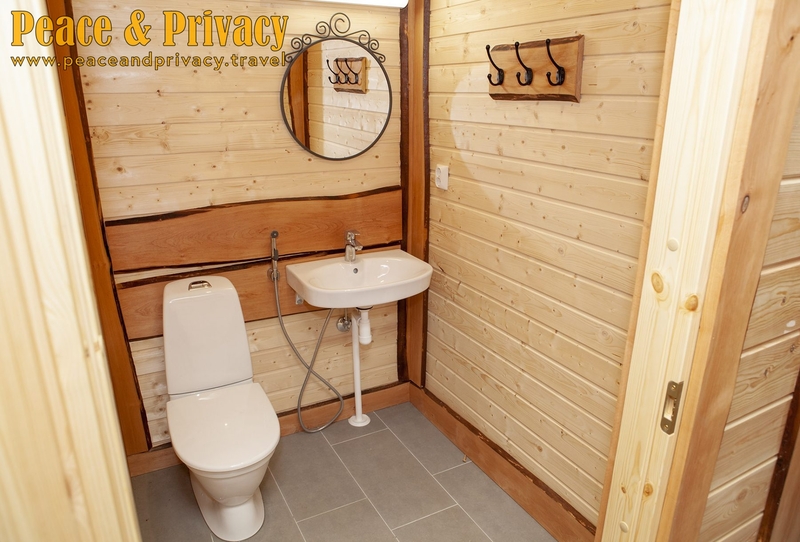 Sleeping Cottage: The smallest building is a separate log-built sleeping cottage which has also been renovated for year-round use. It has bed places for 4 persons in 2 bunk beds. The sleeping cottage’s terrace presents the same beautiful view over the Lake Aulangonjärvi just 30 meters from the lakeside sauna. Terraces and outdoor areas: The large, over 50 m2 covered terrace, suitable for year-round use, surrounds the Main Villa from two directions. 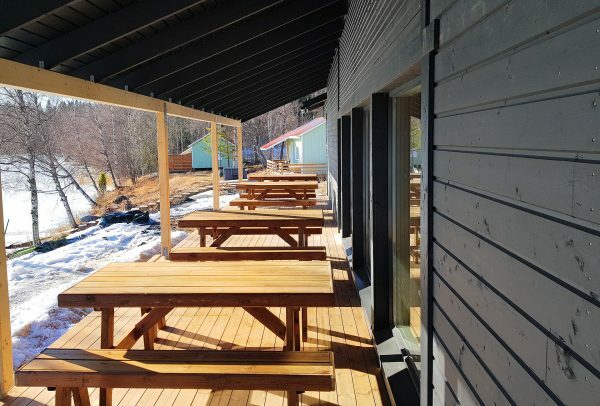 From the terrace you can admire the wonderful scenery of Lake Aulangonjärvi or watch the sunset! Two wood-heated bath tubs are located at the corner of the Main Villa terrace and on the lakeside sauna terrace. In Main Villa’s terrace there is also a electric-heated outdoor jacuzzi for 4 persons. In front of the Main Villa terrace, by the magnificent landscape of Lake Aulangonjärvi, there is a handsome nearly 100 square meter artificial turf that allows for fun-loving golf-petting, badminton games, sunbathing and a wide range of social gatherings! The evergreen grass extends the summer season from early spring to late autumn. In winter, artificial turf on a nice slope offers a great starting point for the world-class sledge games! Fishing, Boating and Paddling: The Aulanko Lakeside is less than 20 meters from the shoreline which makes it effortless to go fishing, boating or paddling on the peaceful lake. During Winter the lake is obviously used for ice-fishing, cross-country skiing and ice-skating. We’ll gladly organize fishing guidance so be sure to ask for more information! Grilling: The yard has a hefty coal-heated grill available (we kindly ask you to bring your own coal). Hiking Trail: The Aulanko Lakeside has a designated hiking trail mostly for snowless periods of the year. You can borrow a map from the villa. In addition, Aulanko Peace is just a few hundred meters away from the beautiful Sibelius’ Forest which is a nature reserve area with guide signs located on the Lake Aulangonjärvi’s east shore. The price includes the use of the Main Villa, Small Villa and the sleeping cottage. Additional services offer the lakeside sauna, hot tub, final clean-up, towels and sheets with the bed made or sheets as a stack. 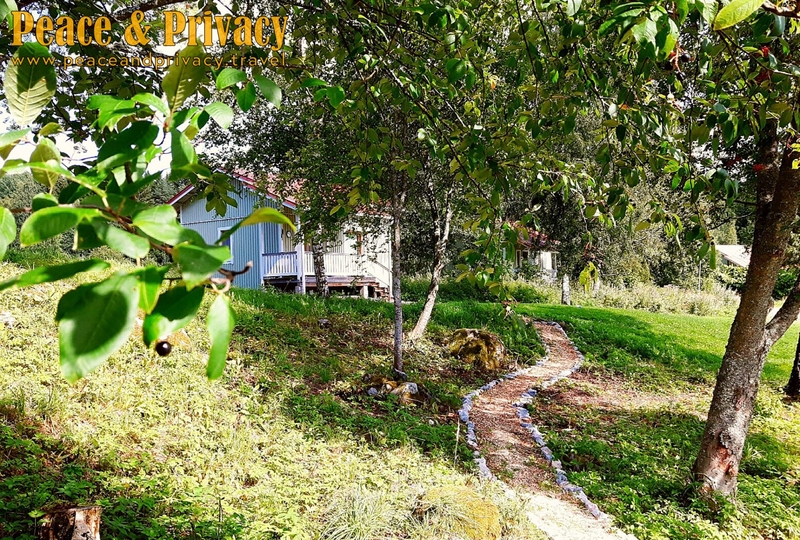 Ask for an offer for Aulanko Lakeside by filling the offer request form or contacting us via email info@peaceandprivacy.fi.